CAP Foundation continues to address the community needs through its unique Child Centered Community Development model. CAP actualizes this by Building Relationships (BR) with children, families and the community thereby improving quality of life through addressing the needs such as early child care, education, child rights, health, sanitation HIV/AIDS, and thrift and credit activities. The project aims to see a child friendly society by adapting various strategies to involve the Community, CBOs, Educational Institutions and Government service providers. Strengthening the systems, building capacities of the community and children, making them participate in the interventions, providing economic support to the families, enhancing the income of women through Self Help Groups, constructing toilets in the schools to help retention of the girl children, support children to improve quality of education at preschools, primary and at high schools, it also efforts to enhances health and hygiene practices in the community. CAP PLAN projects activities are mostly in the nature of facilitation, promotion, protection and capacity building. Apart from he above mentioned entities the project currently focused on the issues related to child counseling, eve teasing, open defecation and most importantly creating a group of foot soldiers to be the change agents in their communities. Self-defense training programme for adolescent girls in schools and communities – Total 560 girl children have been trained on self-defense programme. 1098 girls and 699 boys – adolescent children were made on handling and managing peer pressure, decision making, goal setting and gender discrimination attitudes through counselling programme. 703 (Male – 57, Female -646) parents and community members made aware on the ill effects of eve teasing and early child marriages under sensitization and replication programmes. Parents were oriented on the need for changing the gender discrimination attitudes among parents identifying and nurturing ambitions / skills/ abilities of children, equipping the children with skills such as decisions making, household activities, respecting children by respecting their ideas, attitudes and nurturing the same, accepting adolescent behavior, promoting the children to a goal and providing support through community counselling programmes. 50 young leaders were identified through a rigorous process to transform them into the change makers in the society. From the point of identification to the end of the FY 17 activities a significant change in their attitude, ownership and awareness on the community related issues has been observed. Quality of preschool education has been improved. The Project covered 4547 children constituting 45 percent of the total children in the 32 schools in the Project Area. 1797 school children trained on adolescent behavioral change. 1104 (Female -1086, Male-18) mothers, pregnant women, lactating mothers and community members aware on low cost high nutritious foods, health and nutrition. Medical tests were conducted for 500 adolescent girls and women to identify iron deficiency leading to anemia. 58 anganwadi teachers were trained on safe and hygiene disposal methods of infant feces, strategies for open defecation free slums and consequences of open defecation. Mothers and young women of total 1346 are aware on how to dispose infant feces safely and the regular hygiene practices. GHMC announced 16 communities as open defecation free slums. Water and sanitation facilities were provided in 13 schools and 10 are functional; and awareness given to Anganwadi children on Hand WASH. The project proposes to continue to work in the same 32 suburban slums in the FY18 also. These slums are referred as Communities in the Project locations. 32 communities fall under Quthbullapur mandal. All the 32 slums are located along side of popular Jeedimetla Industrial belt were part of the Ranga Reddy district, Telangana State. However, post the reorganization of the districts in the state of Telangana, the project area now falls under the newly created Medchal district. Based on the study conducted by Prof. Jaya Indresan and Prof. Ravindra Prasad it is understood that the activities being conducted by the CAP PLAN project have attained a certain maturity level and continuing to do the same would be stretching them beyond their time period. There is a need to take these interventions to the next level to yield the results. It is also to be kept in mind that most of the children who were and are getting the benefits of this programme have now grown up to become young adults (adolescents) and hence there is a need of a different level on engagement and dialogue with them. The studies also pointed out though the programme is hugely successful so far, there are few critical issues that need to be addressed in the next 2-3 years phase. Based on these points, this year CAP PLAN project is taking a deflection from the previous years. New activities and strategies for implementation of the same are being proposed on a pilot basis with a time period of 2 years, however few of the activities which are still relevant and meaningful which form the foundation of the community engagement will be continued this year as well. Based on the consultations, the PU identified 50 Young Leaders from the 32 communities. The group of young leaders are the representatives from child councils, Youth groups, Schools and from communities. These Young Leaders network had equal opportunities for boys and girls, from schools with an aim to see these ‘Young Leaders’ as ‘change agents’ to build safer, healthier and productive communities of young people capable of supporting self-directed growth and positive citizenship. Young leader’s empowerment programme is an important programme designed to involve the young children in slum development programmes. The main objective of the programmes in selecting the young children who have potential leadership qualities and encourage them to become a bridge of change in the slums. The purpose of the programme is to develop leadership skills among group of young children aged between 14 to 18 years to participate, understand and learn the slum development change process. Children were identified through self-assessment test on leadership skills followed by group discussions, conducted in all nine high schools and 32 slums total 957 children participated 347 boys, 610 girls wrote the leadership self-assessment test, out of 957, 146 children were shortlisted for second round of group discussions, 111 girls and 35 boys were participated in the discussions. After the group discussions on social problems conducted in all schools, 50 young leaders 29 Girls and 21 boys were identified. Furthermore they were trained for three days in residential programme on understanding slums, how the slums forms in an urban setup, needs of the populations, problems and solutions, additionally on the types of communications for approaching the Government departments for solutions. Two mothers of young leaders were also participated in the programme along with the 20 PU staff members. 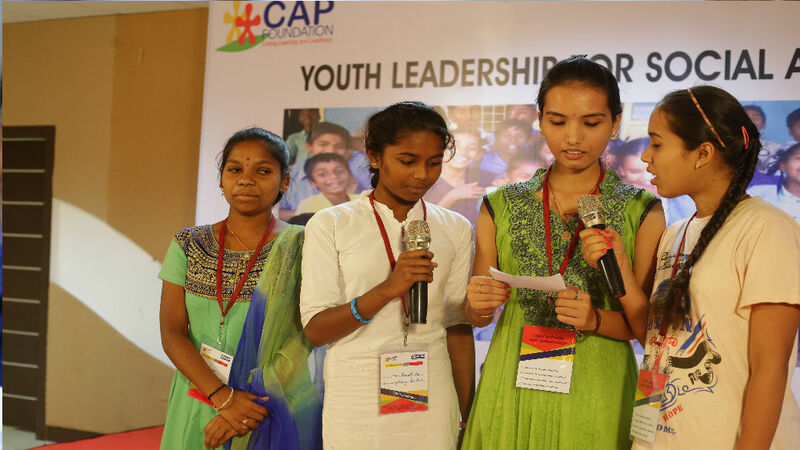 The young leaders selected the themes such as Child Protection, Health & Nutrition, Water, sanitation & Hygiene to volunteer in their living slums in the slum level awareness programmes. The young leaders participated actively in the slum level various awareness programmes conducted by the thematic specialists and PU staff, after immediately completing of the programmes. The young leaders replicated follow up programmes on the same subjects supported by the programme staff and subject specialists.